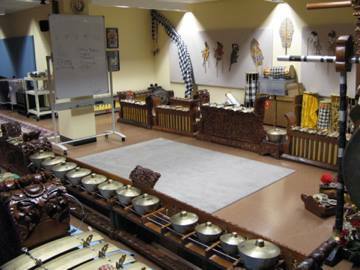 Gamelan is the prevailing traditional music of Indonesia and is an intricate blend of sonorities, structured and patterned in unique rhythmic and melodic systems. It is built largely on tuned bronze percussion, and often accompanies highly formalized dance. Though an ancient tradition with well established values and practices, gamelan is still vital, under constant renewal and expansion. The word refers to the ensemble, the music tradition, and the instruments: we are a gamelan; we play gamelan; we have a gamelan. The sophisticated percussion-based gamelan music of Bali, and the highly refined dance with which it is performed, rank among the world’s richest cultural traditions. No celebration, religious holiday or festival, private ceremony or large social gathering is considered complete without a performance of gamelan music and dance. Especially in the religious sphere, there is a general consensus that an event cannot reach its proper conclusion without a performance. In the eyes of the Balinese, such a performance satisfies the need of both the gods and men alike: through the enjoyment and diversion created by music and dance, both can “return home” with a feeling of well-being. The term gamelan derives from gamel, an old Javanese world for handle or hammer, appropriately so since most of the instruments in the orchestra are percussive. The interlocking rhythmic and melodic patterns found in gamelan music are said by some to originate in the rhythms of the lesung -- stone or wooden mortars used for husking rice. Others ascribe these patterns to the rhythmic chanting of frogs in the rice fields after dusk or the wonderful cacophony of roosters crowing at dawn. The bronze instruments are all hand forged in Bali, using the ancient techniques of the highly respected guild of blacksmiths. Each gamelan is carefully tuned by filing or hammering the bronze keys and gongs to a scale which is unique to that set of instruments; while all gamelans of a similar type will approximate the same scale, there is no standard of reference to bring them into exact uniformity. This is a clear expression of the Balinese belief in a gamelan’s individual vitality and spirit; each ensemble has a unique character. Working almost completely without notation, the Balinese have evolved a unique and highly complex musical language that is based on the concept of kotekan, or interlocking parts. In this system, the intricate melodic figuration of the music is never played by a single musician or group of musicians; it is divided into two complementary parts, which when played together, form the composite figuration. Aside from the sheer sonic complexity that such patterning affords the music, it also allows the orchestra to play at tempos that would otherwise be impossible to achieve. The basic principle underlying all gamelan music is that of stratification. It is essentially a technique of orchestration in which the density of notes played on each instrument is determined by its register -- higher instruments play more notes than lower ones. In addition, instruments are grouped according to their function. Gongs, for example, maintain the basic structure of the music, while mid-register metallophones (gangsa) and the horizontal tuned gongs (reyong) predominantly carry the theme and other instruments provide ornamentation. The kendang, wooden drums with skins stretched over both ends, lead the orchestra by controlling the tempo of the piece. All of these parts contribute to a core melody which is woven not harmonically (as are the independent voices of a Bach fugue), but heterophonically. Essentially, all the voices are variants of a single melody. Raga Kusuma uses a type of Balinese gamelan called, “samara dana,” invented in 1987 by I Wayan Beratha. It combines the orchestration and tunings of the much older seven-tone gamelan samara pegulingan (“gamelan of the love god”) and the more and popular five-tone gamelan gong kebyar.